A Blood donation camp was organized at Civil Hospital Baijnath by Block Medical Officer Mahakal under the World Blood Donor Month Campaign. A team form Blood bank Palampur consisting of Dr Anil Minhas, Sunita Sharma and Vinta Bharwal conducted the camp today. 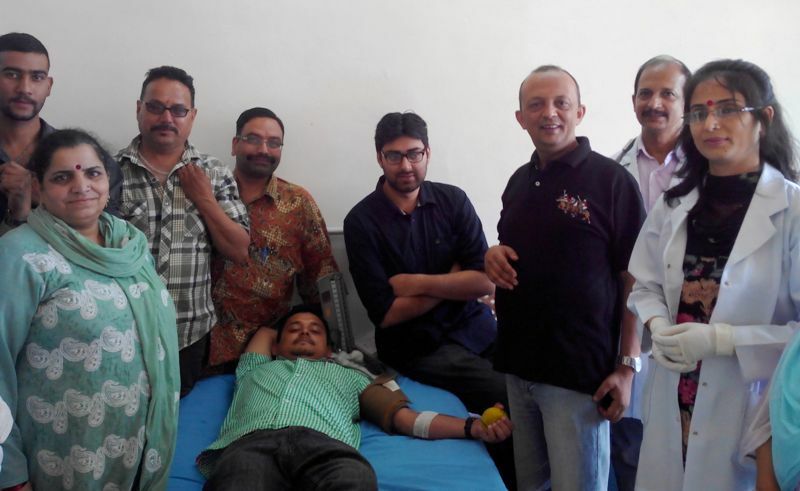 Staff of health department and volunteers demonstrated their leadership to live the theme of World Blood Donor Day "Give the gift of life: donate blood". The donors included Dr. R.K. Sood District AIDS Programme Officer, Dr. Vivek Sood BMO Mahankal, Dr. Gurmeet Katoch M.O. Mahakal, Dr. Nitesh M.O. Paprola, Dr. Ankur Guliani M.O. Baijanth, Smt. Kamlesh Dhiman, Sh. Munshi Ram, Pushpender & Parkash Chand Driver. Speaking on the occasion Dr Dhruv Rana SMO I/C Civil Hospital Baijanth told that there is no substitute for blood, so without blood many patients would die. Any healthy person between the age of 18-60 years and having body weight of more than 45 Kg who has not donated blood in the last three months can donate blood. Blood volume returns to normal level within 48 hours after blood donation. Usually not more than 350 ml of blood is collected in one donation. In the developed world, most blood donors are unpaid volunteers (voluntary non remunerated repeat donations, VNRD) who donate blood for a community supply. In poorer countries, established supplies are limited and donors usually give blood when family or friends need a transfusion (directed donation). There has been a 25 per cent increase in blood donations globally, but there is still a serious lack of timely access to blood for millions of patients around the world who do not have access to blood when needed in a timely manner-and with increasing needs we need more and more donors to give blood. Health Educator Jagdamba Mehta told that 25% of maternal deaths are due to blood loss. People are afraid to donate blood due to fears of weakness, or ignorance about the need of blood, consequently there is a shortage of blood, and awareness campaign is being conducted to remove misconceptions. A Blood storage center is planned at Baijnath to cater to the needs of the people.